Russian-led forces have mounted 22 attacks on Ukrainian troops in Donbas, with no casualties reported, in the past 24 hours, the press service of the Joint Forces Operation (JFO) has reported. "Invaders opened fire on the positions of our troops 22 times. 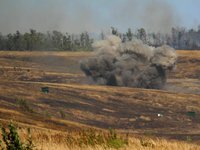 One attack was recorded with the use of weapons prohibited by the Minsk agreements. During the hostilities there were no casualties among the personnel of Ukrainian troops," the JFO staff said on Facebook on Saturday morning. Russian occupation forces opened aimed fire to attack the defenders of Stanytsia Luhanska, Avdiyivka, Pisky, Maryinka, Krasnohorivka, Bohdanivka, Starohnativka, Pavlopil, Hnutove, Vodiane, Lebedynske, and Shyrokyne. According to Ukrainian intelligence, one militant was injured.